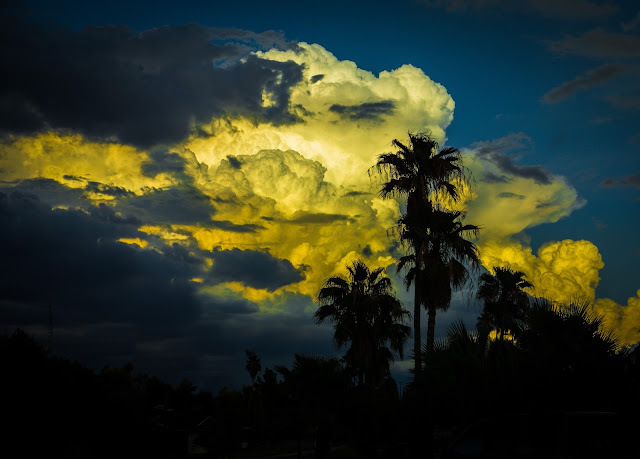 The last day of summer gifted us with the most breathtaking clouds ever to dance an Arizona sky. Meteorologists had predicted we would receive 3+ inches of rain blown up from tropical storms in the south, but nothing more than a few sprinkles ever materialized. All day the sky shifted from spun sugar to marshmallows to ephemeral bolls usually reserved for cotton fields. Just as the little kids returned the chicken/scrap bucket to the kitchen counter and placed two washed eggs in the fridge, a few drops started to fall. Before long, our gutters were rushing, and our pool level began to rise. 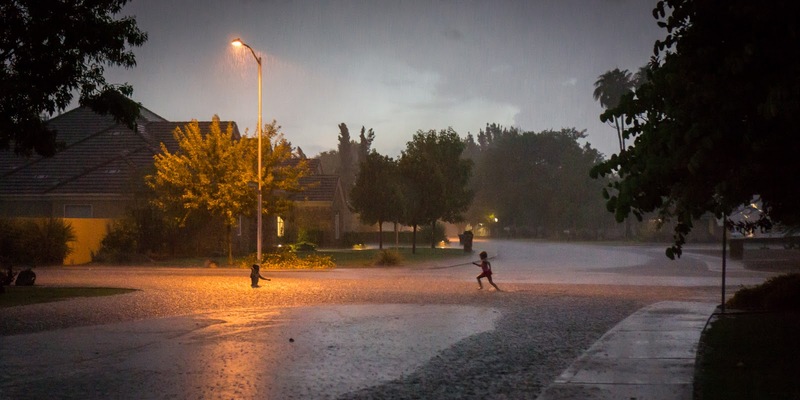 Arizona kids love monsoon storms. My kids watch for them and hope for them and wish for them almost as much as they watch for Christmas and shiny packages under the tree. These spectacular gifts are fleeting, and we never know how long the rain will last. With dinner quickly blessed (with added gratitude for the storm's percussion in the background), food was shoveled and barely tasted, and swimsuits were donned. It was a gully washer. I couldn't let the moment pass without pulling out my camera. That isn't noise in the photos. 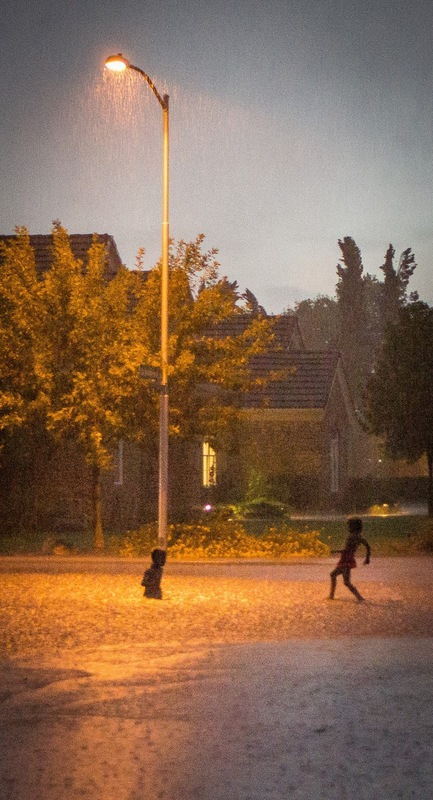 The water quickly filled gutters and spilled over onto sidewalks and lawns. Hyrum and Eve ran and splashed and shivered and floated soda can boats in races through the rivers. Monsoon season ends about the time Fall begins. Fall is a loose term used here in the desert--temps possibly below 100 during the afternoon and deliciously below 70 in the morning. 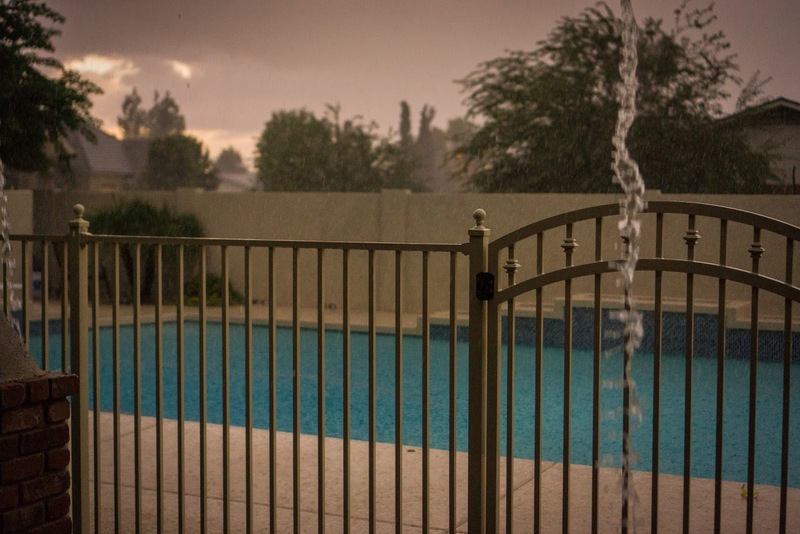 Summer went out like a lion--blustering and drenching the desert with one last celebration. Fall may not bring tons of turning leaves and crunchy apples, but that won't stop me from my favorite part of Fall. It's almost time for an official Boot Day. I'm ready. I'm surprised my 3 minions weren't in the background somewhere. They were out splashing and running... First without umbrellas, then with... baby in clothes.... then baby without clothes..... So much fun. It was a great storm!